This is really steampunk. I love it. Love your steampunk piece, Julia, perfect images! Love your steampunk collage Julia, and I'm in total awe of that lady's flexibility. Brilliant. I love love love this!!! what a great piece!!! 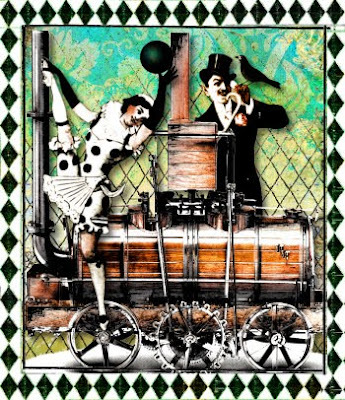 Wonderful and whimsical steampunk- you always add such lovely style to every theme! Oh wow! What steampunk fun. Beautifully done, original and creative. Thanks for joining in this week's challenge, Julia. Your work is always special. Very beautiful!!! ... always very beautiful! What a joyful, beautiful picture. I love it! The gorgeous colours and the wonderfully creative design are superb in every way. Wow! This creation is absolutely stunning! Great job! Have a wonderful upcoming weekend!